This article was peer reviewed by Moritz Kröger, Bruno Mota and Vildan Softic. Thanks to all of SitePoint’s peer reviewers for making SitePoint content the best it can be! Before we dive into the topic we have to answer the crucial question: What is reactive programming? As of today, the most popular answer is that reactive programming is programming with concurrent data streams. Most of the time we will find the word concurrent replaced by asynchronous, however, we will see later on that the stream does not have to be asynchronous. It is easy to see that the “everything is a stream” approach can be applied directly to our programming problems. After all, a CPU is nothing more than a device which processes a stream of information consisting of instructions and data. Our goal is to observe that stream and transform it in case of particular data. Before we dive into RxJS we should list some examples to work with later. This will also conclude the introduction to reactive programming and streams in general. In general, we can distinguish two kinds of streams: internal and external. While the former can be considered artificial and within our control, the latter come from sources beyond our control. External streams may be triggered (directly or indirectly) from our code. Usually, streams don’t wait for us. They happen whether we can handle them or not. For instance if we want to observe cars on a road, we won’t be able to restart the stream of cars. The stream happens independent of if we observe it or not. In Rx terminology we call this a hot observable. Rx also introduces cold observables, which behave more like standard iterators, such that the information from the stream consists of all items for each observer. The following images illustrates some external kinds of streams. We see that (formerly started) requests and generally set up web hooks are mentioned, as well as UI events such as mouse or keyboard interactions. Finally, we may also receive data from devices, for example GPS sensors, an accelerometer, or other sensors. The image also contained one stream noted as Messages. Messages can appear in several forms. One of the most simple forms is a communication between our website and some other website. Other examples include communication with WebSockets or web workers. Let’s see some example code for the latter. The code of the worker is presented below. The code tries to find the prime numbers from 2 to 1010. Once a number is found the result is reported. Classically, the web worker (assumed to be in the file prime.js) is included as follows. For brevity we skip checks for web worker support and legality of the returned result. A non-related but similar example can be given by looking at a user’s input to a search box. Initially, the user may be enthusiastic to enter something to search for; however, the more specific his request gets the greater the time difference between the key strokes becomes. Providing the ability to show live results is definitely desirable, to help the user in narrowing his request. However, what we do not want is to perform a request for every key stroke, especially since the first ones will be performed very fast and without thinking or the need to specialize. In both scenarios the answer is to aggregate previous events over a given time interval. A difference between the two described scenarios is that the prime numbers should always be shown after the given time interval (i.e., some of the prime numbers are just potentially delayed in presentation). In contrast, the search query would only trigger a new request if no key stroke happened during the specified interval. Therefore, the timer is reset once a key stroke has been detected. 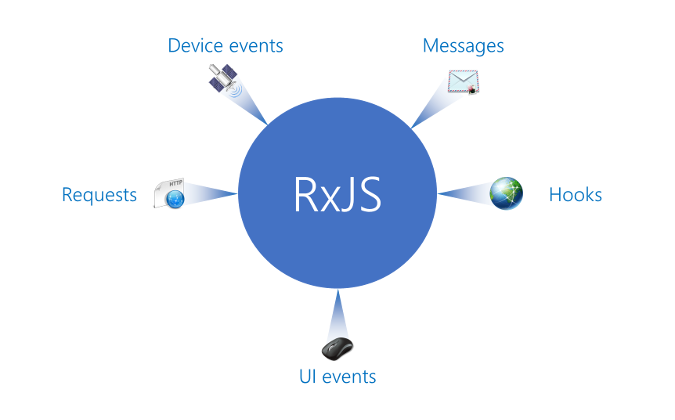 Rx is a library for composing asynchronous and event-based programs using observable collections. It is well known for its declarative syntax and composability while introducing an easy time handling and error model. Thinking of our former examples we are especially interested in the time handling. Nevertheless, we will see there is much more in RxJS to benefit from. Hot observables are pushing even when we are not subscribed to them (e.g., UI events). Cold observables start pushing only when we subscribe. They start over if we subscribe again. We may also return a function containing cleanup logic from the observable creation function. Subscribing to the observable is independent of the kind of observable. For both types we can provide three functions that fulfill the basic requirement of the notification grammar consisting of onNext, onError, and onCompleted. The onNext callback is mandatory. As a best practice we should terminate the subscription by using the dispose method. This will perform any required cleanup steps. Otherwise, it might be possible to prevent garbage collection from cleaning up unused resources. Without subscribe the observable contained in the variable observable is just a cold observable. Nevertheless, it is also possible to convert it to a hot sequence (i.e., we perform a pseudo subscription) using the publish method. The latter is new with ES6 and may be replaced with arrays (even though that’s a bad substitute and should be treated as a single value) for ES5 or older. RxJS now brings in a datatype for providing asynchronous multiple (return) value support. Therefore, the four quadrants are now filled out. While iterators need to be pulled, the values of observables are pushed. An example would be an event stream, where we cannot force the next event to happen. We can only wait to be notified by the event loop. Most of the helpers creating or dealing with observables also accept a scheduler, which controls when a subscription starts and when notifications are published. We won’t go into details here as the default scheduler works just fine for most practical purposes. 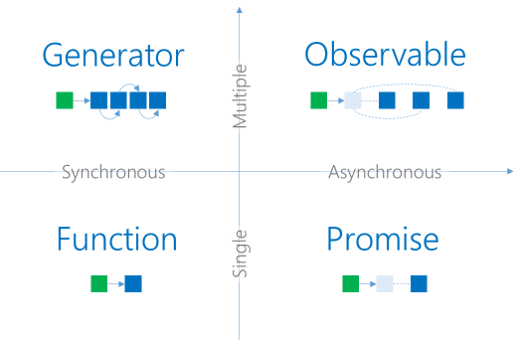 Many operators in RxJS introduce concurrency, such as throttle, interval, or delay. We will now take another look at the previous examples, where these helpers become essential. First, let’s take a look at our prime number generator. We wanted to aggregate the results over a given time, such that the UI (especially in the beginning) doesn’t have to deal with too many updates. Here, we actually might want to use the buffer function of RxJS in conjunction with the previously mentioned interval helper. The result should be represented by the following diagram. The green blobs arise after a specified time interval (given by the time used to construct interval). A buffer will aggregate all the seen blue blobs during such an interval. Furthermore, we could also introduce map, which helps us to transform data. For instance, we may want to transform the received event arguments to obtain the transmitted data as a number. The fromEvent function constructs an observable from any object using the standard event emitter pattern. The buffer would also return arrays with zero-length, which is why we introduce the where function to reduce the stream to non-empty arrays. Finally, in this example we are only interested in the number of generated prime numbers. Therefore we map the buffer to obtain its length. The other example is the search query box, which should be throttled to only start requests after a certain idle time. There are two functions that may be useful in such a scenario: The throttle function yields the first entry seen within a specified time window. The debounce function yields the last entry seen within a specified time window. The time windows are also shifted accordingly (i.e., relative to the first / last item). We want to achieve a behavior that is reflected by the following diagram. Hence, we’re going to use the debounce mechanism. In this code the window is set to 300ms. Also we restrict queries for values with at least 3 characters, which are distinct from previous queries. This eliminates unnecessary requests for inputs that have just been corrected by typing something and erasing it. There are two crucial parts in this whole expression. One is the transformation of the query text to a request using searchFor, the other one is the switch() function. The latter takes any function which returns nested observables and produces values only from the most recent observable sequence. Note the nested observable (which might result in undefined for invalid requests) which is why we’re chaining switch() and where(). Where do you see RxJS shine?